The Imperial Avenue townhome complex is a 56-unit development in the Monta Vista district of Cupertino. Originally built to be relatively inexpensive, with square footage to fit a growing family, these townhomes are still some of the least expensive homes in high-end Monta Vista. 2) The Imperial Ave. area is one of the least expensive neighborhoods in prestigious Monta Vista. For families who want to move up into the Monta Vista area and gain access to its schools, this is one of the easiest entry points. 3) The HOA has a low fee, particularly considering the value of these homes. They do pay for the maintenance of the white picket fences that give this complex a middle-American theme. 4) Access to 85 and 280 is trivially easy, with strong connecting access to 101. Arguably walking distance to De Anza College. 1) The townhomes on Imperial Ave. on the same street as several auto body shops. 2) Aside from a courtyard, there is very little green space within or around the complex. 3) Many of the front-facing units overlook the nearby office complexes. Inner townhomes might face the garages of others in the complex. Many rear townhomes overlook a parking lot, which is separated from the complex by a wall. 4) Train tracks run close by but ironically there isn't access to public transportation by train or light rail in Cupertino. 5) Most townhomes here on Imperial are relatively thin, with 2.5 or 3 levels depending on how you look at it. Some units have oddly positioned fireplaces whose flues (and the walls enclosing them) block what would have been open space between levels. 1) Cupertino's reputation for schools builds demand for its homes. 10182 Imperial Ave. (1795 sqft.) went in 2004 for $790,000 and a unit with the same configuration, 10192 Imperial Ave. went in June 2007 for $990,000: a difference of $200,000 or 25.3%. See threat #1 below. 2) Being the lowest cost entry point into an internationally-desirable school district gives these homes instant and immediate marketability. 3) It seems strange that some developer hasn't purchased the land occupied by the auto body shops, or several of the smaller homes in the neighborhood, for re-development. 4) Nearby Blackberry Farm is planned to reopen in 2009. 1) The reputation Cupertino has sometimes overshadows other opportunities. For example, at the Expressions of Sunnyvale, 996 Alpine Terrace, Unit 5 (1895 sqft.) went in 2004 for $630,000 and in May 2007 for $802,000: a difference of $172,000 or 27.3%. 2) People from out of town wouldn't think this street had a one million dollar home, much less fifty-something. 3) If the trifecta of schools became less-desirable for some reason, this neighborhood's desirability also drop relative to others where there is less of a price premium. However, Cupertino voters consistently choose policies that will protect their schools. And if there were any erosion, it would take time. Since school boundaries and availability may change based on enrollment needs and population shifts, it is always a good idea to check with the local school district (Cupertino Union School District, Fremont Union High School District) for the latest information. 1) Abraham Lincoln Elementary (see ratings and parent opinions). 2) John F. Kennedy Middle (see ratings and parent opinions). 3) Monta Vista High (see ratings and parent opinions). It's not world famous for it's homes or real estate. Folks outside Silicon Valley know it as the birthplace of the iPhone. Apple, Symantec, and a very large portion of HP --- to name a few --- call it home. To locals, Cupertino is synonymous with the school system. The Cupertino Union School District has 24 elementary and middle schools, 19 of which are ranked by the California Department of Education as 10 out of 10 statewide. And that doesn't account for the elite Monta Vista High School, as well as Lynbrook High School or Homestead High School (as part of the Fremont Union High School District shared with Sunnyvale and other cities) which all rate 10 out of 10 statewide as well. The real estate in the Cupertino part of Silicon Valley commands a premium over other cities in the area. The darker lines on the chart show what the median price of condos and townhomes, and single-family homes in Cupertino. The faded lines show what the median home prices are in Santa Clara County as a whole. The difference between the two types of lines is the premium you pay in housing prices to live in Cupertino. How much is that premium and how has it changed over the last decade? Steady state. Or at least as steady as real estate gets in June. Over the month of June in past five years, Cupertino home prices have remained above Santa Clara County prices, to the point where the premium has been consistent between 35% and 39%. This is lower than the premiums commanded between 1998 and 2002 when single-family homes were over 50% --- as high as 71% --- more expensive than the median across Silicon Valley. Too much of a premium and the local micro-climate bubbles relative to the area. Cupertino was itself ahead of the curve in 1998 and again in 2000 with a local peak of $880,000 for a median home that year. Since its last price decline in 2003, single-family homes in Cupertino have been tracking the aggregate median without much fluctuation. Given the talk in the news about home market collapses around the country, many home buyers are risk averse, preferring to minimize the amount of their potential loss rather than maximize their potential gain. A vast majority of people in this part of the Silicon Valley market cycle fall into this category. Demand for high-quality townhomes, condominiums and houses in Cupertino has not been completely met because of a strong decrease of 23% in homes available between June 2007 and last year. Inventory is at levels not seen as low since June 2000, when it was at 72, and multiple offers on good properties are still common. For my clients who want the strongest schools for their children, Cupertino makes an equally strong case. For my clients who want a solid foundation for their next home, Cupertino has steady indicators and foundation in education. If these are factors you value, then it represents a comparatively safe decision in Silicon Valley. There are places that aren't like that, and you can find one example at the end of this article about a neighborhood in San Mateo. Flat and down. Those are words you might not expect in the real estate market of a city with some of Silicon Valley's most renowned schools. And it's a reputation Cupertino added to with three of its high schools, as part of the Fremont Union School District, earning the coveted California Distinguished School Award in 2007. With good schools, come good real estate prices --- so the saying goes. Looking at the chart, it's a fact that, relative to the Santa Clara County average, Cupertino townhome and condominium prices got ahead of themselves in 2006, right? After all, that number was ahead of the average by 43%. What if I said that last year's market number isn't nearly as bad as it's been and the March 2007 number is a steal? Cupertino Townhomes and Condos Are a Steal? 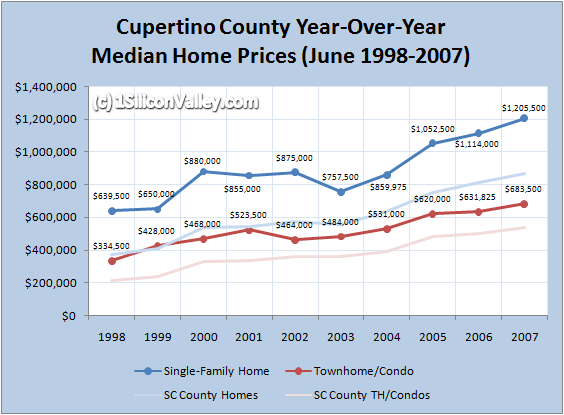 I mentioned Cupertino townhomes and condos as a bargain in my Silicon Valley Housing Market - April 2007 overview. Here's another way of looking at it: by measuring premiums. In this case, the premium is how much the median price of a Cupertino home is above the Santa Clara County median price. 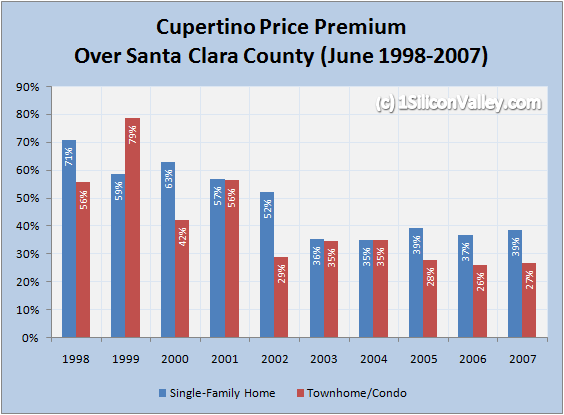 The fact is that the premium for a Cupertino condominium or townhome this year, at 23%, is the lowest it's been for all the years back that RE InfoLink has released data. Looking at the chart, you can see the pattern where there's a spike and a dip every other year, almost in lock step. I'm not making an attempt to predict the future, but using those same glasses people use for hindsight, it's not hard to see that there's a window for people looking to capitalize. 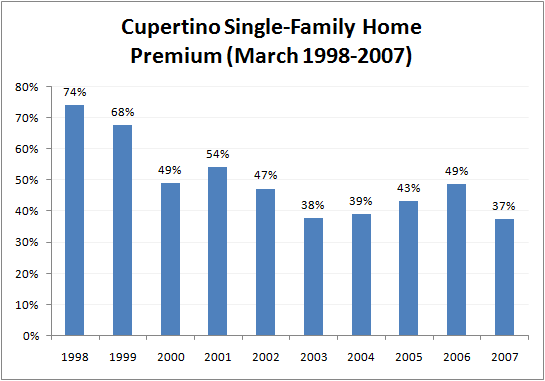 The premium for single-family homes in Cupertino is back down to 2003-2004 levels, but in reality, there's actually a very slight correction going on here even though the median home price went up from $1.12 million in 2006 to $1.14 million in 2007. Inventory stayed relatively steady at 65 vs. 69 a year ago in March and 161 in 2003 (at the end of the most recent price slide). But the DOM number has been steadily increasing over the past three years from 21 to 33 to 42. There would probably have been a fall-off in price but new listings have decreased for four years running (94 in March 2004, down to 53 in 2007). Based on only pricing data --- not the personal needs and wants my clients and I discuss --- I'd advocate getting a townhome or condominium in Cupertino, but I have a more wait-and-see attitude towards single-family homes in the area... especially with the summer vacation for schools coming up. After all, in an area that relies heavily on the quality of its schools for its residents, the end of the school year may mean more pressure on properties that have been on the market for a while already. For my clients whose search is specific to Cupertino and isn't time-constrained, I'll usually add some of the weaker properties (which I think will hang around) to my property tours so that we can revisit them when the time is right. With the Cupertino Square revitalization efforts in full-swing, there are going to be added entertainment and shopping options for Cupertino residents. These things take time but they're definitely making forward progress. The California Department of Education (CDE) just released the recipients of its California Distinguished Schools award, which honors the "exemplary and inspiring" schools across the state. Typically only 5% of schools are awarded with the California Distinguished School title, which schools are allowed to use for four years --- and in 2007, there were 21 Silicon Valley schools (11 from San Mateo County and 10 from Santa Clara County) that received the honor. Elementary and secondary schools are evaluated in alternating years and, this year, it was time for the middle and high schools to go under the microscope. As frequent readers here know, I'm a big advocate of not only looking at real estate in established educational powerhouses, but also finding up-and-coming schools. After all, schools power real estate demand --- even if you don't have kids --- and people looking for the "next big thing" in terms of appreciation need to look beyond what's already been priced into the market. There were some big winners this year in Silicon Valley and this article kicks off a week of market analysis homing in on key cities in these school districts. Here's a whirlwind tour. Fremont Union primarily covers the Silicon Valley staples, Cupertino and Sunnyvale, but also includes areas of other Santa Clara County cities including Los Altos, Saratoga, and San Jose. Three of Fremont Union's five high schools received the California Distinguished School award this year. Monta Vista High School and Lynbrook High have both amassed five of the awards, while fellow 2007 winner, Cupertino High, has been named a California Distinguished School three times. 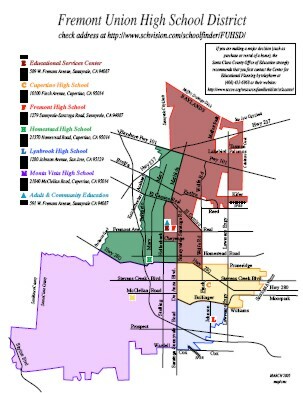 The Fremont Union High School District web site has a PDF map that shows the areas each school in the district covers. Sequoia Union covers a wide stretch of Silicon Valley and the Peninsula, serving the San Mateo County cities of Atherton, Belmont, East Palo Alto, Menlo Park, Portola Valley, Redwood City, San Carlos, and Woodside. Three of Sequoia Union's four comprehensive education high schools (Sequoia Union has one vocational high school) won this year. And of the award winners, both Sequoia High School and Menlo-Atherton High School have won the award twice, while Carlmont High School has won the award three times. The Sequoia Union High School District web site has a handy tool that lets you check what school any given address in the district feeds into. The Campbell Union High School District has two up-and-coming schools that are brand new winners this year, Del Mar and Branham High. And, further north in the San Mateo Union School District are two more first-time winners, Burlingame High and Hillsdale High. I'll post the latest home values in the 1SiliconValley.com Housing Market section. On cue, our feathered friend hopped up onto the wine barrel and struck a pose. He was the photogenic one. A friend of his was laying in the shade preening himself and another went roaming the grounds for bugs, but that wasn't him. No, he'd been following some of the other visitors around the winery but he put on his full strut when he saw the gleam of my camera lens. Here he was: the side of Cupertino not many people get to see. Hidden off the rugged Santa Cruz Mountains with Montebello Road carving its winding path, Cupertino is Silicon Valley wine country. The signs were everywhere and they weren't subtle. This was also rattlesnake country and people were just visitors. With a view that stretched well beyond Moffett Field and downtown San Jose, past the East Bay with clear skies, though, nothing else had my attention. Here was the Ridge Vineyard and Winery, proper and formal, yet rustic in its nature. The beautiful mountain. The name of the Ridge Winery estate and the name of their flagship red, unsurprisingly, Monte Bello (with the space). And in keeping with the traditions of great temptation, they will give you your first taste for free. They welcome guests on weekends, but on weekdays with reservations only. Have you ever been flashed by poultry? The two women just ahead had gotten out of their cars and were walking leisurely, up the path towards the farmhouse where Picchetti Winery holds its tastings. Hidden behind the barrel marking the entryway and sensing his opportunity, he burst out from his cover, running towards the ladies and rearing himself --- literally --- in full glory. The Pichetti sangiovese is good, but it's not what I'll remember from this winery. 1935, the year before Turing Machines. That's the year when the Stevens Creek Dam and Reservoir was constructed. Some people pass this piece of history before entering Cupertino wine country. You can't miss it: it's entire view on your left heading up to Montebello Road. Others come here to spend the afternoon sitting on the steep angular concrete wall that is the Stevens Creek Dam, with fishing rod in hand, enjoying the reflection of the sun off the water. This is Cupertino too. As we stood under the cathedral ceiling looking over the stone-tiled patio, we could hear the owner and his son playing their XBox in one of the bedrooms. It was penned off from the rest of the house so that Cujo wouldn't get loose. I thought the top-level townhome was in pristine condition considering they had a Cujo, until I peered into the room and saw a tiny 10-pound pug sitting attentively in front of the television! So I asked whether he had a wireless network and his face lit up. He hopped over to the storage closet in the entryway and eagerly showed off the router, neatly and carefully wired into the connectivity panel. He didn't check for CAT-5e because he didn't need it. The network drops were a "nice-to-have" for my client who does a lot with multimedia. They weren't a dealmaker (and as he discovered not a dealbreaker) but given that this was the first home he'd seen as a potential buyer, he was eager to get some experience looking at houses under his belt so that he could really experience firsthand what his requirements feel like. For any number of reasons, what people say they want doesn't always line up with what they really want in their minds and hearts. A lot of times that's because of the difference between theory and application: being able to actually drive the commute or experience how many flights of stairs there are gives people a clearer picture of "could" vs. "won't". The tricky part is separating the borderline "must-haves" from the "shoulds." And with my client in the early stages of his home search, we needed to setup a stable foundation so that we'd learn those differences from every property he would see on the rest of his search. I sat in the office of another client, across from him and his dustless mahogany desk. I briefly peered out towards the Silicon Valley hills through the shades of the window behind him before he lifted his brow from thought. He muttered cautiously, "That's a good question..." and placed his chin on his hand in the universal position for "I don't have an answer for that yet." He wanted to tell me something but the way his eyes focused into the distance, you could see a little fear, as if to say, "People will think less of me for saying what I'm really thinking." I'm not judgmental and I don't remember saying anything at that point, just tilting my head to the side a little. But what I got back, I never would have expected from this formal and staid lawyer. "I WANT A HOUSE!" he exclaimed. "I want a place where the neighbors respect where we live. If they see trash on the ground, they pick it up because they feel ownership. I want to live in a place where I don't have to be ashamed to say, 'I live here.' I want my neighbors and I to be peers and for them not to look at my car and go, 'Who does he think he is?' I want my wife and kids to feel important. I want to be able to carry on a meaningful educated conversation with the people living around me. I WANT A [ed. deleted] HOUSE!" That joke one of my clients made about me being an iceman must be partially true because with a hint of a smile in my expression, I winked a little and asked in an ironic, almost dry manner, "So, what did you want again?" 1/ Prestige. This is a really sensitive subject. On the one hand many people want to be regarded and respected. On the other hand, people fear that by wanting to be regarded and respected, that people will actually think less of them. But the root cause is that sometimes people judge others based on a mental picture of where they live. What do you think of when I say New Jersey or Alabama? Or East Palo Alto? (I'm from Louisiana: insert stereotype here!) If prestige is important to you, then that should be included as a criteria in your home search without emotional prejudice. 2/ Owner's Mentality. I have a personal story here, all this over a simple piece of paper. I lived in a large apartment complex that was in a good location, was kept in decent condition, and had below market rents so I could save money and buy a house. I stepped out of the elevator next to the trash chute and noticed a crumpled piece of paper lying there on the ground. As a renter, my first instinct was, "Oh, the maintenance people will take care of it." I eventually did throw that paper away but it left me wondering whether I would have thought twice if it were in front of the home I lived in. 3/ Neighborhood Pride. Have you ever been to a sleepy old manufacturing town whose plant closed long ago? Where people can't wait to find a way out? Or a town that's languishing under the weight of its own lack of culture. The transient nature of people living there is much different than the sense of community an identity engenders. 4/ Belonging. Whether it's being close to the culture of your parents or your parent's parents, to feeling like you can relate to your neighbors, that sense of belonging can be very important to your enjoyment of your home. Sometimes it doesn't even boil down to culture. If you're single, living in a family community with lots of kids around may not be preferable to being closer to other singles whom you can relate to. And being a movie junkie with a huge home theater system (read: speakers) in the middle of a complex of semi-retirees might not make you any friends. 5/ Less competitive schools. Some parents, even though they care about their children's education, don't want to put that much competitive pressure on their kids. This is one I hear with increasing frequency. After we left the top-floor townhouse owned by the gentleman at Cisco, I told my client that, yes, you can have your dream house, but only if you know what's really important to you. After all, since homes are so expensive, you don't want to have to pay for amenities and benefits that mean nothing to you. Why would you spend your hard-earned money on something you don't need or want? Here in Silicon Valley, people make trade-offs every day when buying real estate but it takes a lot of self-reflection and some experience actually going through the home search process for those priorities to really become clear. "Maintaining the lawn just sounds like work. If I'm going to be doing work, it may as well be for work!" he said. The land you get on a single-family house is valuable but if it hurts your lifestyle, then what are you paying for? According to RE InfoLink, in February 2007, the difference between buying the median townhome or condominium and the median single-family is between $200,000 and $300,000 in both Santa Clara County and San Mateo County. My client in this article chose to look for townhouses and condominiums because he can get more square footage inside the home for the same money and minimize the responsibility he has for maintaining the property. He doesn't have any kids or need room for a swing set, but if he can get a small yard or patio for entertaining, that would be perfect. Ever hear the advice, "You should always buy a home where there are good schools?" There are advantages to this because these are neighborhoods which are (in general) the last ones to decline and the first ones to appreciate, but remember that if the neighborhood has a reputation for good schools, that reputation is already priced into the house. My client used the words, "I'm single and this isn't my last house. Why would I want to pay for a good school district?" If you have school-age children, you may save money by buying in a less expensive neighborhood and sending your kids to private schools. You will get more house for your money if you don't have to pay for the school district's reputation. And you may get more upside from an ascending school district which is building a great reputation than one that's maintaining its high scores. When the best kept secret in the area comes out, people will be looking for that good value. Cupertino and Palo Alto, among other cities in the Bay Area, have prestigious school districts. How do the median prices for single-family homes compare with other cities around Silicon Valley? The chart of figures from February 2007 speaks for itself. What are the best kept secrets in Silicon Valley? That's a whole 'nother article. I had a client say that he enjoyed a reasonable commute time to be able to "switch modes" and another wanted to catch up on reading while on the train. I'd argue that most people consider commuting a necessary evil based on where they live and work. Time is money, right? Well, almost, because no matter where you were born, what your parents have, or what your opportunities are, everyone starts off with 24 hours in a day. You can measure the value of your time in two ways. Economists measure the value of time in terms of opportunity cost, the amount of money you can make with your time at its highest and best use. Most people measure it in exactly the same way except with things they can be doing: activities like spending time with the family, and reading a book, to taking a second honeymoon. At only half-an-hour each way, the commute costs $62,500 over that period and $125,000 if your commute is an hour (two hours a day) each way! There's no value judgment behind these numbers. Some people want to save money to keep their families fed, happy and well-educated so they will trade more commute time for cash savings. Others prioritize spending more quality time doing other things and choose to allocate more resources to the problem. The beauty is that the choice is up to you and experiencing a house search with an expert is an effective way of truly understanding what you want and what you're willing to trade-off. Centrally located in Cupertino on Civic Park Lane, the Silverstone Communities Villagio is less than one mile from Symantec world headquarters and less than two miles from Apple's world headquarters and Hewlett-Packard's massive Cupertino complex. The eight-building complex targets high-tech workers with standard connectivity pre-wired. Cable TV outlets and four telephone lines are wired into every room. Each unit also comes standard with gigabit-capable CAT-5e ethernet vs. the slower CAT-5. It's a nod to us techies out there that they knew the difference. Available configurations include the 1,433 square foot Magnolia town home with 2 bedrooms, 2.5 baths, and a private two-car garage with additional storage, located in the complex sub-level. The Lotus condominium hosts 3 bedrooms and two bathrooms in its 1,350 square feet. Several new stores are planned for the commercial spaces that line the sidewalk-level retail units along the central entrance as well as the retail building across the way from the local courtyard, which looks onto Civic Park. Its schools include C.B. Eaton Elementary, Sam H. Lawson Middle School, and Cupertino High School (a California Distinguished School in 1990 and 1994), all of which currently rank in the top 10% of California schools, rated by API score, for their grade level. The Villagio is about one mile from Cupertino Square and less than five miles from Santana Row and Valley Fair. The Metropolitan is a brand new community of townhomes and condominiums located in central Cupertino just steps away from Cupertino Square (formerly Vallco). This modern complex is a high-tech worker's dream, only minutes away from Apple's world headquarters and HP Cupertino, among other tech campuses. I drove there from Sunnyvale near Bedford Square, close to the 85 and 101 interchange, and it was only a few miles. Folks should have no trouble getting to and from other destinations with The Metropolitan's stone's throw proximity to 280, 880, and 17. And if you have kids, you already know about Cupertino schools. This video quick tour highlights the Metropolitan's Tribeca floorplan with 3 bedrooms, 2 bathrooms and amenities described below. Sorry about the quality of the video --- I'm still learning the ropes --- but the video is much better than the thumbnail would lead you to believe! Prices here start in the low $600's and the complex includes community amenities such as a fenced swimming pool, courtyard wi-fi access, a kids area with playhouse, secured garages and key card security entrances. There are four floorplans efficiently laid out from 1,087 to 1,530 square feet and there are a number of courtyards that give the complex an urban feel. All of the kitchens come with maple cabinetry, Whirlpool appliances, Kohler stainless steel fixtures, and granite slab countertops. Milgard double-glazed windows and sliding doors, Cal Royal security locks, and a Apollo hydro-heat and cooling system are also standard. According to the Cupertino Courier, the former Vallco (which is going to be renovated and renamed Cupertino Square) is getting a brand new high-end bowling alley, to be named "Strike." Mall general manager Mike Rohde uses the words "progressive" and "modern-looking" to describe the 38000 sqaure foot addition. The renovation's centerpiece the new AMC movie theater which Rohde says will be open in April.